Not to be confused with salami. For the restaurant in Seattle, see Salumi (restaurant). Salumi (singular salume) are Italian cold cuts predominantly made from pork. Salumi include bresaola, which is made from beef, and also cooked products such as mortadella and prosciutto cotto. 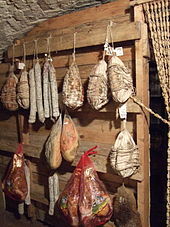 Salami is a specific type of salumi. The word salumi comes from the Italian word salume, pl. salumi "salted meat", derived from Latin sal "salt". ^ OED sv. salumeria, n.
Look up salumi in Wiktionary, the free dictionary.